Description: Cap 3 to 17 cm, flattened convex or centrally depressed, velvety at first then more suede-like, margin inrolled at first, lobed to undulate, cream to buff-orange; teeth 4 to 6mm, soft and brittle, cream-colored, sometimes decurrent; stem 3 to 10 cm long, 1 to 3 cm thick, sometimes off-center, dry, smooth, whitish or colored like the cap; flesh white to cream, thick, brittle; smell and taste mild; spore print white. All parts slowly bruise orange-brown. Habitat: Scattered to gregarious under conifers, from mid fall to late fall. Primary Keys: Cream to buff-orange cap bruising orange-brown; teeth not gills or pores. Edibility: Choice, but older specimens can be bitter. 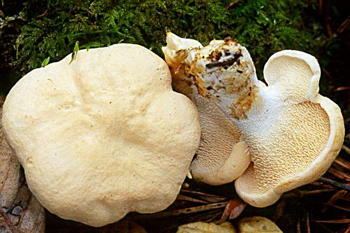 Notes: This mushroom is moderately rare, but easy to identify, delicious, and bug-free. It often grows where Chanterelles grow, and is now even in the Cantharellales order. Simmer potatoes in salted water until just tender. Meanwhile, cook the onion and mushrooms in the butter over medium heat for 10-15 minutes. Stir in the flour and cook another few minutes. Gradually add the sour cream, stirring frequently until bubbling but not boiling. Remove from heat, add 1 T. dill and season to taste. When the potatoes are done, carefully peel them, and slice into neat rounds. Put the potatoes in a heated serving dish, spread the mushroom sauce over the top, and top with the remaining dill.